If you have to press key two times for typing double or single quotes (and keys like tilde), you need to change keyboard layout. Here are the steps! Sapna has been facing a tough day at work. She has to type a long document but for typing double and single quotes (and also some other keys like tilde) she has to press the key twice. If she presses, for example, the double quote key nothing gets typed on screen —but as soon as she presses the same key again, or another key, two double quotes mark appear. Then she has to delete the extra quote before proceeding further. Many people face this intriguing problem on their Windows computers (including the latest Windows 8). Let’s see how to get around this problem. 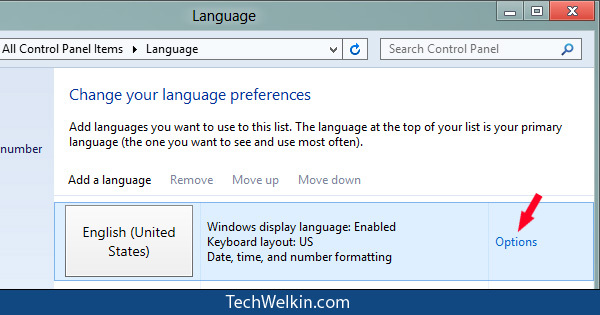 You will get a screen where you’ll see the list of languages that have been installed in your computer. Click on Options link opposite English language. On the resultant screen you can add or remove keyboard layouts. Just remove the US International layout and add another English layout layout. You may not need to add the new layout if it is already there. This will solve your problem in a jiffy, just like it worked for Sapna! I hope this article was useful for you. Please feel free to ask in case you have any questions. I will be happy to try and help you. Thank you for using TechWelkin. Thank you so much, excellent! It is very useful! This problem only appeared after a recent Windows 10 Insider build. It has been a mystery for 2-3 weeks. It works properly ! Thanks a lot..
thank u sir… this solution is perfect. Really Thank You So Much for valuable information. Your information helps me a lot. As like this share your other knowledge as well. Once again thanks a lot. It works! Thank you so much! God bless you! Thank you very much.. it was an excellent article and i was looking out for solution to this problem from a long long time. Kudos to you and please help to keep sharing such articles.